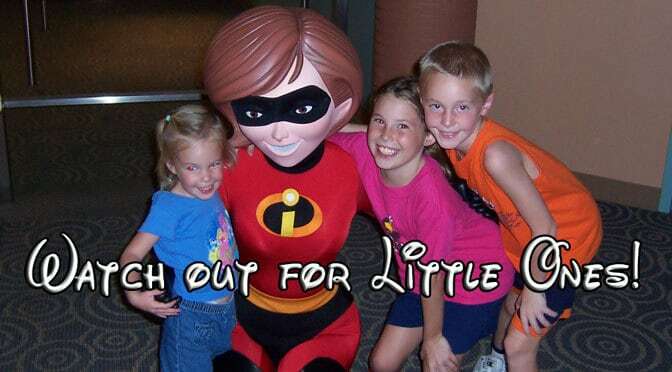 Disney Characters: Watch out for the little ones! To expand on an already great post about great ways to interact with characters, there are a few people that visit the Disney Parks that can be easily overlooked when seeing certain characters. The people I am referring to are the smallest visitors to the Disney parks, small children.“But Disney is for the kids! What in the world are you talking about?? ?”We all look forward to the first time our child sees Mickey, Pluto, Donald, Daisy, Minnie, or Goofy, but the fact of the matter is that many of the non-face, or fur characters cannot see past the ends of their noses. Literally. I’m not just quoting Mary Poppins to keep this as Disney-fied as possible.The long snouts on some of our best friends’ costumes make it extremely difficult to see items that are low to the ground and because of that, it is very easy for them to not see some of their smallest friends who have come to visit. One of the ways to counteract this potentially upsetting interaction is to let the characters know who is there to see them and where they are. The easiest thing to do is to greet the character by saying things like, “Oh Mickey! We are so happy to see you! Johnny over here and Susie over there have waited a very long time!” or give them an indication that a child is off to the side and out of their view. They will reposition to greet everyone to make sure the little soul is not going to miss a goofy hug! Letting the characters know who is around helps them play around as well. Some of my favorite photos are with Pluto and Goofy, getting down on the ground or crouching down to play with my children! Another item that should be considered with small kids and characters is that [unfortunately] not everyone is a fan. 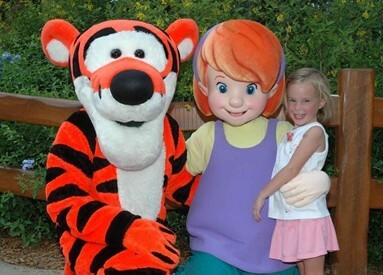 We hope they will love their Disney friends as much in person as they do on TV, but as one too many of us can attest to, they don’t always warm up to Mickey and friends the way our hearts are set on the interaction going.There are several ways to go about this if you have a hesitant or shy child. The characters are AMAZING at interacting with everyone – from the most enthusiastic to the most scared. In some cases, a family has a mix on the enthusiasm spectrum. IF you have a child that falls into the hesitant/shy category; one that is willing to go through the queue but has no desire to hug/touch/get a high-five from a character (be it face or fur), here are a few survival tips to make everyone make it through without tears or a meltdown. Go through the queue and let whoever wants to rush up for that first hug, do so. Let the shy child hang back with the picture taker. Let Mickey, Minnie, Cinderella, Goofy, etc. know that little Tammy or Tommy is happy to see them, but would just be happy with a wave. The characters will take note and give a very enthusiastic wave, but they shouldn’t try to approach. This method also rings true for the coveted character meals. The first time I took my family to WDW was in 2009 when my children were 2 ½ and 6 months. We booked ‘Ohana for breakfast, and I mentioned to the CM on the phone that I had heard that Stitch was a bit on the unruly side to which they offered me this bit of priceless advice: if you have a hesitant party member, seat them away from the aisle when you reach your table. The characters rarely, if at all, walk in between the tables, most everyone goes out to the aisle to meet them. You can also ask the characters to give them a wave here, too. They will not approach a hesitant child (or adult) if they are asked not to. Two simple tips to help survive character interactions! I cannot say enough about the “character” of the characters and what they do for children of all ages to make us feel special when we go to greet them. My children have become avid character hunters when we vacation – I would hazard to guess that they prefer the interactions to riding any rides or seeing any shows. At the ripe old ages of 5 and 3, they would rather spend a day chatting with Mulan, Pooh, Jafar, etc. than running for a Fastpass for Jungle Cruise. I wholly credit a character for saving one of our vacation nights in 2010, it’s an interaction I will NEVER forget. Mickey’s Not So Scary Halloween Party 2010 – the evening started very wet and rainy, but we donned our ponchos and went into the park at 5pm. We got in line to see the Dwarves (6:30p) – we didn’t want to wait 2 hours to see them – but DS4 was not having anything to do with seeing any characters – he wanted to ride Haunted Mansion. We normally would have conceded to his request, except we came to find out that there were a few unruly mansion inhabitants that heard that the Halloween party was starting and they left the mansion to find some candy (E.G. – HM was not operational at the time and we would have to come back MUCH later). He didn’t throw a fit, but he wasn’t about to meet anyone new until he got to ride HM.Long story short, we met the Dwarves, stopped in to see Woody and Jessie at the dance party and headed over to Adventureland to the character trail. Our first stop was Tarzan, Terk, and Jane Porter on the Veranda. We got to the head of the line, and DS, clutching his autograph book wouldn’t go up and talk to the trio – he stood by me while I took pictures of DH and DD. Terk got a good read on DS and took the liberty to come over to him, crouched down and gave him a hug. He then led DS by the hand over to the rest of the group where he was greeted with a huge smile from Jane and Tarzan staring at his unnaturally large ink pen. From that point on, DS was a different kid because he felt loved and wanted by the characters. For their training and caring, I will be forever grateful! We had a toddler that was very shy and would have nothing to do with the characters during the first day of our trip. In fact he hid under the table during character meals! The second day we had breakfast at Ohauna’s and it looked like it was going to be another day of hiding from the characters until it was Stitch’s turn. Stitch took the time to stop and played with him under the table until he came out. My toddler laughed and played and even went around the restaurant in the parade with Stitch. Mickey came after Stitch and my toddler greater him like an old friend. From then on he was first to running up to characters and interacting with them. Stitch saved the vacation in my opinion because my toddler’s favorite moments ended up being meeting all of his “friends from TV”. We learned this the hard way on our daughter’s first trip when she was 2. We were the first in line to meet Mickey our first day of our trip. When he opened the door she screamed. She was afraid of all characters for the rest of our trip. She finally warmed up to them the following year. Snow White at Akershus was amazing and ever since then she loves them. Our January trip was spent character hunting. She is now 4, and our youngest (7 months at the trip) was spotted by all the characters and got some great interactions with them as well. I do wish I had known about the seating at character meals as it would have made the rest if our character meals her first trip a lot smoother. It helps to let them know if there is an unseen disability. In 08 my 70 year old mom had about cried bc she didn’t get to interact with Piglet at CP. Well in 09 I told Piglet my mom can’t see you Piglet but she loves you oh so much and OMG Piglet just about squeezed her to pieces! It was awesome. Thanks, Jennifer! We had to figure it out ourselves when 17 month old screamed hysterically at first approach by Eyeore at Crystal Palace on our first morning, her first visit. Giving the characters those verbal cues helped make our group interactions more enjoyable and efficient. Piglet didn’t have to guess what to do when we gave hints like you described.